A true Easter special! 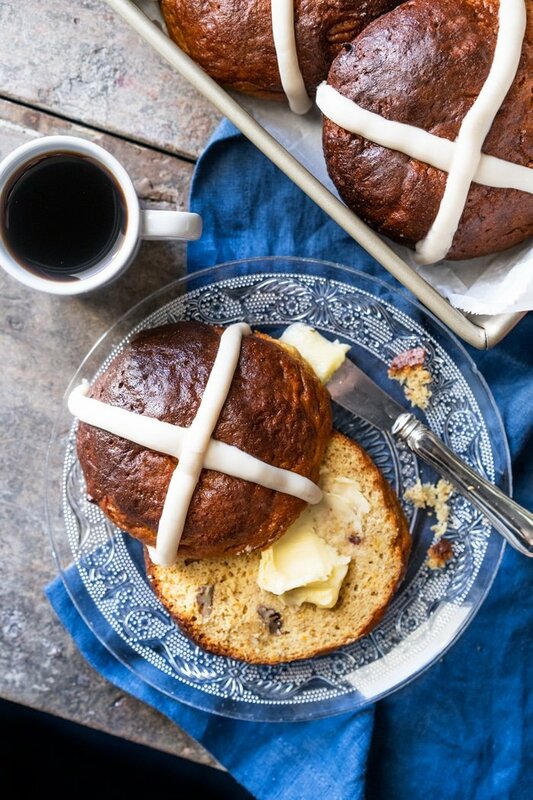 Expect these gluten free and keto hot cross buns (with actual yeast!) to be extra fluffy, beautifully spiced and a real delight! 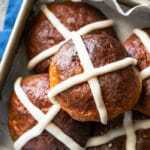 Hot cross buns are a real beauty right?! With their gorgeous spices and yeast notes, they truly are a must come Easter in my book. And if you have yet to try them, think a little bit like a brioche, Italian panettone, or Mexican Rosca de Reyes. Honestly guys, I’m very proud of this one! Took a little bit of work, but it’s fairly marvelous how much it does resemble real hot cross buns. Albeit more dense because well, no starches and gluten. 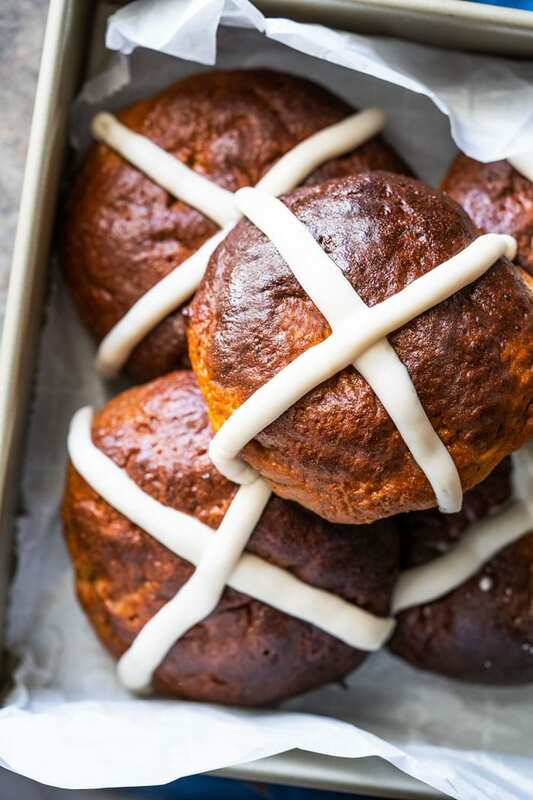 And you might be surprised, but (like with all our gluten free yeast breads), making these keto hot cross buns is incredibly simple really. There’s no kneading, double resting time, etc.. which gives much more room for error. But, like with any yeasted bread, it does require you take care of a few details to ensure the best possible outcome so be sure to read (or skim!) through the post. Compared to other yeast bread recipes on the site (sandwich bread, cinnamon rolls), this one falls the least post bake. 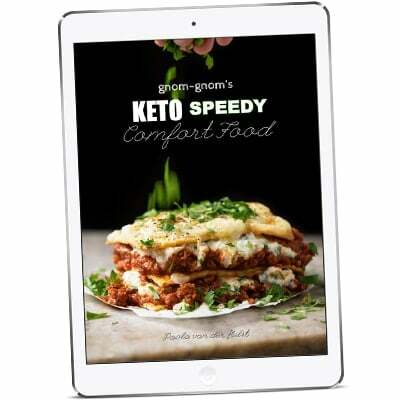 Though do note that keto flours are notoriously heavy and moist) and certain missing proteins (think gluten), so they will be denser than normal buns. I’ve tried these in both Mexico City (super high altitude) and LA (sea level) and they work just as well. They do, however fall a bit more than our panettone (which was baked mini panettone molds, and they seem to support the structure). Still, very little shrinkage! You just must ensure your rolls do almost double in size while proofing, and it can take anywhere from 1.5-3 hours (deepening on your temperature, altitude, how many add ins you have..). This dough does require a little extra warmth. For instance, I place my tray on top of my oven as I heat it up (so my tray gets slightly warm and they rise beautifully). But you must ensure you don’t overheat them or you’ll kill the yeast. Think a warm and humid day at the beach, that’s the ideal temperature. Proof the yeast. This involves mixing dry active yeast with water that’s just warm to touch (between 105-110°F to be precise) and inulin or an actual sugar (think maple syrup or honey) for 7 minutes until foamy (see picture below). And before you scream sugar (!!) remember that the yeast will feed on such sugar to emit carbon dioxide, so it doesn’t affect the carb count. And yes, this is a scientific fact (but if you’re weary, just use inulin!). Baking at high altitude? Yup, so am I (Paola here!!). No changes need to be done here! 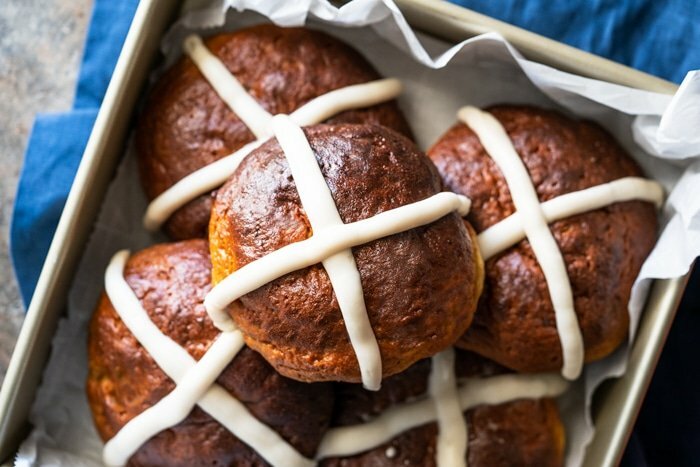 These hot cross buns do have quite a few ingredients, but you’ll find that most are staple paleo and keto pantry ingredients. In the list below you’ll find details on several ingredients and possible subs. But if possible, please do try and make this recipe without any subs. Almond flour. You truly need a super finely ground almond flour here, as if you use meal your bread will turn out dense and oily. Super fine almond flour brands include Anthony’s (my favorite), WellBees and Bob’s. 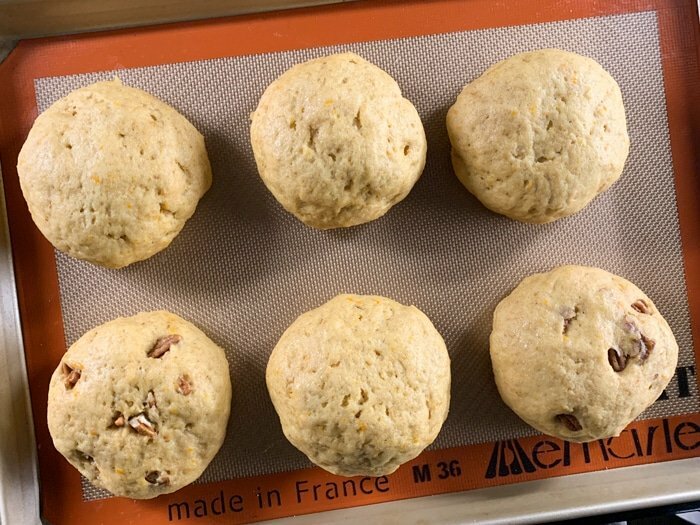 If you want a lighter bun, you can do 3/4 cup (72g) of your regular almond flour and 3/4 cup (75g) of the fat-reduced almond flour (the one from our pancakes). Similar to most peanut flours out there, this almond flour has been cold-pressed to remove 80% of its fat. This essentially reduces calorie content by 50% (hooray! ), and makes for some seriously fluffy baked goods (double hooray)! And if paleo, or in keto maintenance, you can lighten up the bread by substituting part of the almond flour (1/4-1/2 cup) with arrowroot flour in a 1-to-1 ratio. Flaxseed meal. You’ll want to use golden flaxseed meal (I use Bob’s), and regrind the flakes in your (very dry!) bullet or blender until finely powdered. Great way to avoid slimy bread. Whey protein isolate. 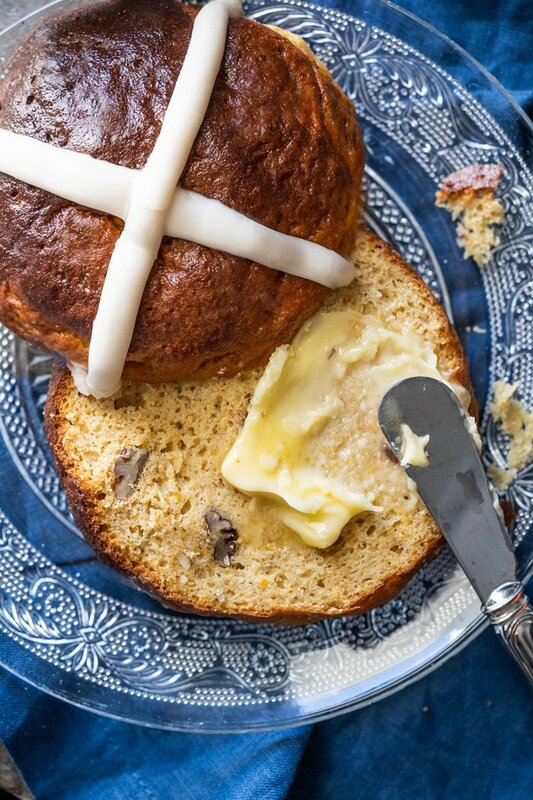 This one is an absolute must, as it will ensure your hot cross buns don’t collapse post-bake. Keep in mind that this ingredient varies tremendously from brand to brand, and I’ve only tried (and are super happy!) with Isopure’s Zero Carb Unflavored. A bit tricky because well, store-bought dried fruit ain’t the most keto of foods… though still doable. If you’re very keen, you can boil some cranberries with sweetener (allulose and xylitol work great here). And then, once softened (though not mushy), popped them in the dehydrator (or your oven at roughly 150-170F) to dry out slowly. And you can follow the same methodology with orange peel too! Alternatively, what I did here was to simply use toasted pecans (and it worked great!). But chocolate chunks would work great too paired with the orange hues! These sticky buns work best with erythritol (Lakanto is my fav!) and allulose. (Important note!) I recently made the connection (while at the dentist!) that xylitol inhibits yeast and bacteria growth (which is why it’s the sweetener of choice for dental products). So don’t use xylitol! See recipe video of the cinnamon rolls for guidance on the methodology (similar yeast doughs, different ratios). And check out the post for deets, tips and possible subs! Note: if using a stand mixer, feel free to use the paddle attachment for easiest mixing. Add yeast and a dash of ginger to a large bowl, set aside. Mix inulin (or maple syrup), water and sour cream in a small bowl. Heat up over a water bath to 105-110°F. And if you don't have a thermometer it should only feel lightly warm to touch. Pour lightly warm sour cream mixture over yeast, cover bowl with a kitchen towel and allow to rest for 7 minutes. The mixture should be bubbly, if it isn't start again (too cold water won't activate the yeast and too hot will kill it). Mix your flours while the yeast is proofing. Add almond flour, flaxseed meal, whey protein powder, sweetener, xanthan gum, baking powder, salt, cinnamon, nutmeg and allspice to a medium bowl and whisk until thoroughly mixed. Set aside. Once your yeast is proofed, add in the eggs, vinegar and orange zest. Mix with an electric mixer for a minute or so until fully mixed. Add the flour mixture in three parts, alternating with the softened butter. Keep on mixing until you can no longer see any streaks of butter. The dough will become very sticky, so you want to work quickly to get it mixed properly. Use a wet spatula to gather the dough into a ball. 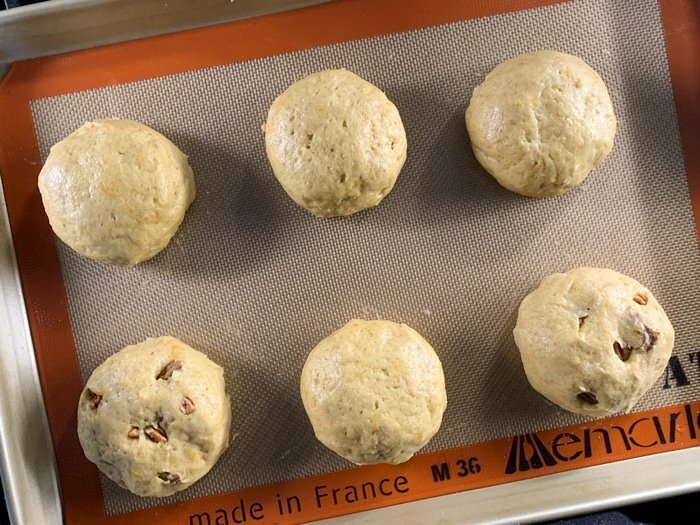 Lightly wet your hands and form the dough into rounds (I suggest 8 buns, but you can do 6 large ones too). Place on a baking tray, cover with a kitchen towel and place in a warm draft-free space for 1.5-3 hours until the dough has almost doubled in size. How long it takes depends on your altitude, temperature and humidity, but just keep in mind that because this is an enriched dough it'll take its time to rise (just be patient!). And note that if you don't see it rising, it likely needs a little more warmth (say the top of your oven!). Preheat oven to 375°F/190°C while the dough is proofing. Lightly brush with egg wash, being careful to avoid the edges so they're able to rise when baked. Bake for 10 minutes at 375°F/190°C, reduce temperature to 350°F/180°C and bake for further 15-20 minutes. Hot cross buns should be a deep brown when done, but feel free to tent with foil to prevent over browning (around minute 10-12). Allow to cool on the tray for 20 minutes and transfer to a rack to cool completely. Keep in mind that they continue to cook while cooling, so you really don't want to cut before! Keep stored in an airtight container at room temperature for 3-5 days. Serve at room temperature or lightly warm. Whisk thoroughly together the icing ingredients until it forms a thick paste. Pipe it in a cross shape atop each bun once they're completely cool. *You can feed the yeast with either inulin or an actual sugar. 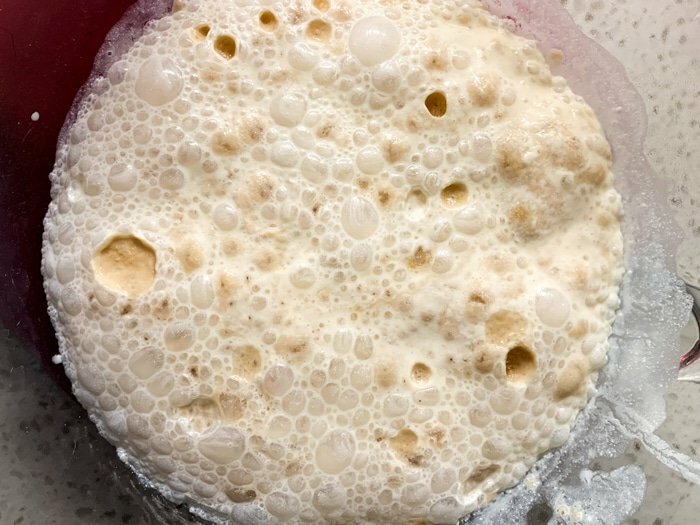 And do remember that the yeast will feed on sugar to emit carbon dioxide, so it doesn’t affect the carb count (but if weary, just use inulin!). **If you want a lighter bun, you can do 3/4 cup (72g) of your regular almond flour and 3/4 cup (75g) of the fat-reduced almond flour (the one from our pancakes). Similar to most peanut flours out there, this almond flour has been cold-pressed to remove 80% of its fat. This essentially reduces calorie content by 50% (hooray! ), and makes for some seriously fluffy baked goods (double hooray)! (Important note!) I recently made the connection (while at the dentist!) that xylitol inhibits yeast and bacteria growth (which is why it's the sweetener of choice for dental products). So don't use xylitol! Please note that nutrition facts were estimated per hot cross bun, assuming a yield of 8 (3g net carbs!). I love your bread and buns recipe(s) so much that I have 4 bags of the dry ingredients mixed and in my fridge, just waiting to be made into more buns. I want to make these, too, but unfortunately the defatted almond flour is “unavailable” on Amazon and “out of stock” on the Sukrin site. Any idea if they’re going to make more of this product or if they’ve discontinued it? That’s so wonderful to hear Diana! 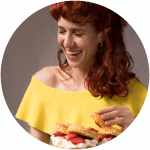 I’m emailing with Sukrin, and they told me that they’ll be back in stock on Monday (they sold out after the pancake recipe! )… I’m still doing some testing on the bread and bun recipe, but it will also be great for giving those a lighter texture. So you can make this one without the de-fatted flour (same as you do with the other two recipes), but I’ll be adding this flour as a note to a lot of recipes nowadays 😉 xo! That’s so wonderful to hear Patricia! Thanks so much for reporting back!! xo! The Sukrin almond flour is still totally sold out across the UK it seems! 😂😂 Hoping they restock soon. Dear Francesca, every single time I see a stroopwafel I think of you (totally not kidding lol!!). And regarding the croissants, that’s honestly one of my culinary goals (i.e. I’m not giving up!). I also believe Sukrin is getting a new shipment of the flour on Monday (at least in the US), so keep your eyes peeled and I’m pretty sure you’ll love it (its terrific in pancakes!). Big kiss and have a lovely weekend! We’ve made most of your keto yeast breads and they’re all truly unbelievable! Intrigued about the fat reduced almond flour and will surely have these for Easter 🙂 Thank you for all that you do Paola! Monica that’s so wonderful to hear! You’ll surely love these too then (and yup, that almond flour is a game changer for these breads!) ;)!